Originally from Puerto Rico, Dr. Rodriguez completed his undergraduate studies in Pre-Medical Sciences at the University of Puerto Rico. He subsequently completed his medical studies and performed his Physical Medicine and Rehabilitation residency training at New York Medical College where he was elected Chief Resident during his senior year. In 2013 and 2014 he was awarded the Joji Sakuma, MD award in honor of Dr. Sakuma’s years of service as a distinguished clinician and teacher in the department of physical medicine and rehabilitation. During his residency training, he developed a special interest in spine disorders and musculoskeletal injuries and underwent additional training, completing an interventional spine and pain management fellowship at OrthoCarolina in Charlotte, North Carolina. 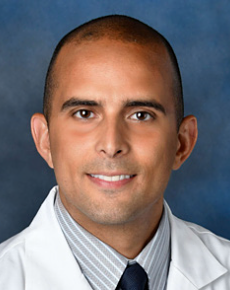 Dr. Rodriguez speaks fluent Spanish and has been a medical advocate to the Hispanic community helping them with spine and musculoskeletal medical problems.